Tailgating, Distracted Driving, and Accidents: Who Should Be Responsible? Driving a car requires dividing one’s attention among a number of essential elements: speed, the presence and actions of surrounding vehicles, stoplights and cyclists/pedestrians, as well as other drivers. The complexity of making the necessary assessments as a driver significantly depends on the weather, time of day and the density of the environment, i.e., city vs. rural. Failure to keep tabs on these issues can easily lead to car accidents and possible serious injury for those involved. Two behaviors that are particularly at risk of causing an accident are tailgating and distracted driving. Tailgating is not a new phenomenon, and likely existed from the time people started sharing roads. Distracted driving, while always present to some extent, is becoming a large problem as people are more focused on their phones and tablets instead of the road in front of them. Distracted driving can often lead to inadvertent tailgating as the driver becomes unaware of cars slowing down or stopping. A personal injury lawsuit was recently filed against Apple for a car accident that resulted in the death of a 5-year-old girl. The at-fault driver was allegedly using FaceTime, and rear ended the car carrying the girl. Proving someone is at-fault in a car accident requires gathering certain types of evidence to show the driver’s actions were negligent. A discussion of how one could prove negligence in tailgating- and distracted driving-related accidents will follow below. the defendant was injured as a result. One method of showing negligence is to prove the other driver violated the law. Tailgating essentially means a driver is following too closely to the car in front of him/her, and the vast majority of states, Florida included, have laws making it illegal to drive in this manner. Florida requires all drivers to keep a “reasonable and prudent” distance between vehicles, with the appropriate distance depending on the speed of travel, the amount of traffic, and the roadway’s condition. Tailgating is not the easiest issue to prove, but through the presentation of accident photos, eyewitness statements and police reports, fault could be shown. 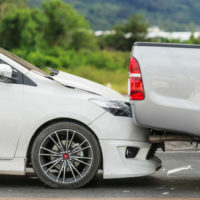 In addition, in some cases, retaining the services of an accident reconstruction expert to testify about what occurred can greatly assist in proving negligence. Driving and texting is known to create a danger to others on the road, and 46 states have laws banning this activity to prevent avoidable collisions. Florida prohibits all drivers from manually typing on any wireless device designed to send and receive communications. The use of hands-free devices is permitted. Proving negligence in a case of this type would involve the types of evidence listed above. Additionally, requesting data use records from the driver’s cell phone provider would reveal if the device was sending/receiving messages at the time of the accident. While proving the violation of a law does not automatically prove someone is negligent, it does serve to strongly demonstrate the person was not exercising the amount of care and caution appropriate for the situation. If you were injured in a car accident, speak to a personal injury lawyer about filing a lawsuit against the responsible party. Car accident injuries can be life-altering, and the party at-fault should have to pay for his/her actions. The Miami law firm of Pita Weber Del Prado knows how to build a strong case, and lead you through this difficult process. Contact us for a free consultation.